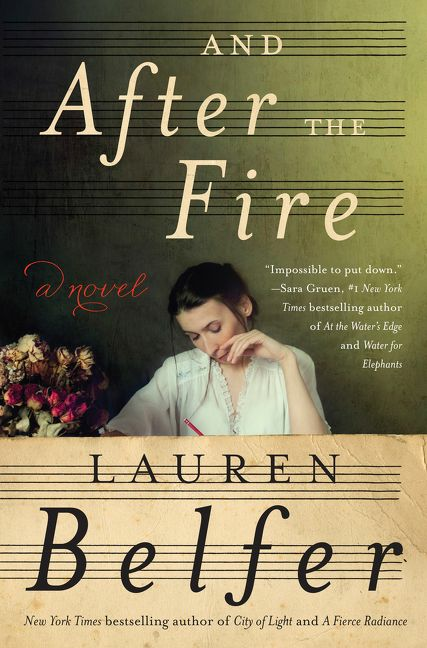 AND AFTER THE FIRE by Lauren Belfer intertwines history and music within a riveting mystery. The settings alternate between Berlin in the late 1700s to mid-1800s, and 2010 in New York and Germany. The plot starts with Susanna Kessler inheriting a manuscript supposedly signed by Johann Sebastian Bach. She is determined to return it to its rightful owner with the help of Dan, a Bach musical expert who is not Jewish. This journey will challenge her preconceptions about herself, her family’s history, and also offer an opportunity to finally make peace with her violent past. Intertwined with Susana’s current day story is the life of Sara Itzig Levy, a renowned musician in the 1800s, who receives an unsettling gift from her teacher, Bach’s son. This work’s disturbing message will haunt Sara and her family for generations to come, especially “the lost cantata” of Bach with unmistakable anti-Semitism in the recitatives. G-d’s teachings and are devout, like Dan, they experience tragedy? LB: I wanted to show how it is such a shocking experience with such disconnect. The setting is on a beautiful plateau over looking a valley with trees and the mountains in the distance. As I wrote in the book not much is translated into English, but Michael, who can read German, deciphered stuff. Many people will not understand the more shocking aspects. For example, these rule books for SS Officers talked about the uniform requirements and ‘leave’ guidelines. But with that are also instructions on how to take over the property or apartments of dead Jews. Being able to have someone translate these German documents took it to a whole other level. But Mendelssohn is the one who championed and revived the St Matthew Passion! If Bach were anti-Semitic, why would he have done that? One of my choral societies started rewriting the libretto to the St John Passion to eliminate all Jewish references. Don’t blame Bach–blame the Bible! That is where Bach got his text. This reminds me of the people who recommend we ban classics like HUCKLEBERRY FINN.